Back on the Sea Hunter the unloading continued. It was hard to believe it had been over a month since leaving Maine and here we were, finally giving the aid to where it was intended. It seemed however, to be taking forever, but the aid was put into small boats and driven a ½ mile to shore. With over 200 tons of aid, it would take more than a couple days. After a few days, things seem to calm down and go a bit more smoothly. 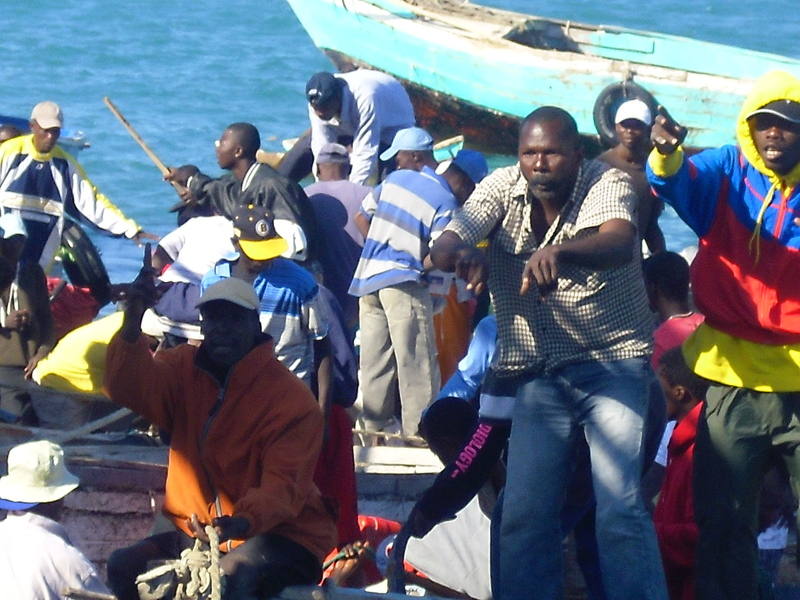 There were Haitians working alongside the crew of the Sea Hunter. Boxes would be handed from one person to the next and then piled into a small boat below. When they got to larger and heavier items (such as crates of bottled water) Brian Ryder (chief engineer) would run the ship’s crane to move it along. Most of my time was spent cooking and cleaning up or sitting in the pilot house either watching the goings on or taking pictures. I would wander down on occasion to help out but there were more than enough strong men, so I mostly watched from a distance. It seemed unusually hot that 3rd afternoon as I stood on the fossil deck and fanned myself to catch a breeze. The activity was humming along when I noticed a much louder commotion coming from a couple of the small Haitian boats. A handful of men seemed to be arguing when one shoved the other. A few around them tried to calm the situation but didn’t seem to be working. Before long, instead of just three or four arguing, it was now seven or eight men. I saw a couple of the crew walk over and try to defuse the situation. When nothing happened, we had Kikki (one of our Haitian helpers) yell through his megaphone that unless they stopped we would not continue unloading. This also did nothing to change the situation. I can tell you, it was making me a bit nervous. I do not like confrontation and did not want to see anyone get hurt. 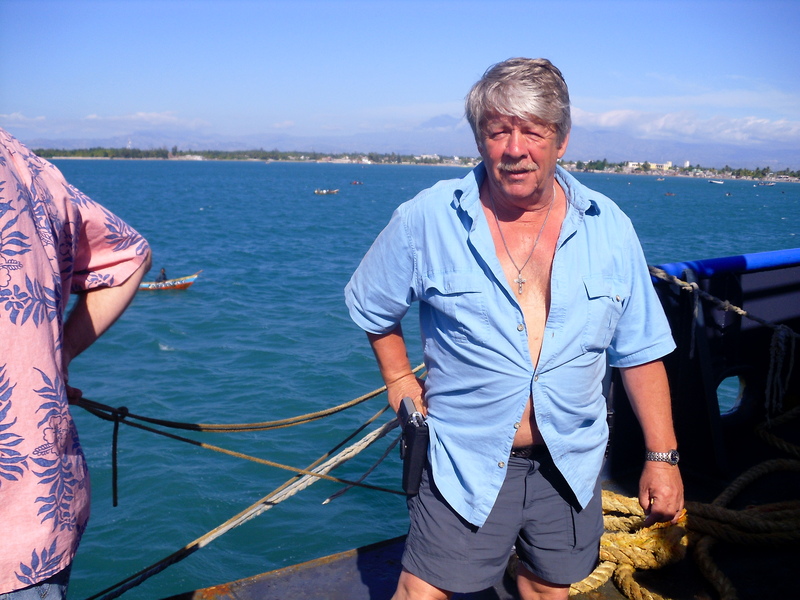 Brian (chief engineer) got the ship’s large water hose out and aimed it over the rail towards the fighting boats. He then turned it on full blast and waved it back and forth across the sea of boats below. He thought the shock of the spraying water might catch their attention, but it only seemed to quiet them for the moment. As I looked across the waters I saw the United Nations Police boat heading towards where the confrontation was. They revved up their engine and sped close to the smaller boats which in turn caused a ripple effect. They rocked back and forth and up and down a few times to really cause waves. Within seconds, all the boats were rocking up and down. This caused those in the boats to either hang on or risk falling overboard, which did happen to some. Again, this quieted the situation for the moment, but once the waves subsided and everyone was secure back in their own boats, it started up again. I was really getting nervous and felt someone was going to get seriously injured. I could see Greg and Gary were getting worried too. Of course we didn’t want anyone to get hurt and this wasn’t the impression we wanted to leave behind. We needed to defuse this situation and do it quickly. As I turned to see what more we could do, I saw Greg stepping out from inside the ship. On his hip I noticed a holster with a handgun. As he walked past me, he said, “This is going to stop now.” He walked over to the railing, lifted the gun from its pocket, pointed it to the sky and pulled the trigger a couple times in succession. Immediately the area went silent and everyone turned to look where the sound came from. With megaphone in hand he quite simply explained that this kind of behavior would not be tolerated; that if it continued we would pull up anchor and leave, aid in all. That seemed to work! Within a couple minutes, everyone was back to work unloading and the arguments forgotten. What a relief. What could have turned into a really bad situation was stifled with a couple shots in the air. Though I was originally opposed to bringing guns aboard, I witnessed the effect they carry, and thankfully, no one was hurt.